Shoulder pain and injuries are the second most common orthopedic condition we face as adults. There were over 7.5 million visits to the doctor for shoulder pain in 2006, according to The American Academy of Orthopedic Surgeons (AAOS). The majority of these injuries are a simple tendonitis but some become complex conditions, potentially requiring surgery. Overuse and excessive force are the primary factors creating shoulder injuries. How can you care for your shoulder at home and when should you go to the doctor? Knowing some basic shoulder anatomy and what to do when symptoms begin can help answer these questions. There are two joints we address when we evaluate shoulder pain. The primary concern is the glenohumeral joint which is a ball and socket joint. This is made up of your humerus, which is the long bone in your upper arm, and the glenoid, the front part of the shoulder blade. This joint is unstable by design to allow for tremendous movement and flexibility. The shoulder lacks strong ligaments that would both stabilize it and limit movement. Instead, the 4 rotator cuff muscles provide stability to this joint. With overuse, they can become inflamed, which causes Rotator Cuff Tendonitis. This is extremely common and can be painful. The second joint examined is the acromioclavicular joint which is comprised of the collar bone and the acromion process which comes off the top and front part of the shoulder blade. This joint sits just above the other and creates its ceiling. Irritation to this joint via overuse or arthritis can also cause rotator cuff tendonitis symptoms as well. Tendonitis is an inflammatory condition meaning tendons are swollen and irritated. Rotator Cuff Tendonitis causes pain in the joint and the muscles do not function properly causing weakness and damage. Most patients will report pain on the outside of the shoulder, which is where the rotator cuff muscles attach. Over time, the pain may travel down the outside of the arm to the elbow. It may cause pain when reaching overhead or behind your back and when sleeping on the affected side. These acute symptoms need help. Most patients may run straight to Ibuprofen or a stronger anti-inflammatory drug. But not all patients can stomach these (literally) and some patients take them for too long, which leads to other problems. Ice is a good at-home remedy but few patients remember to use it. 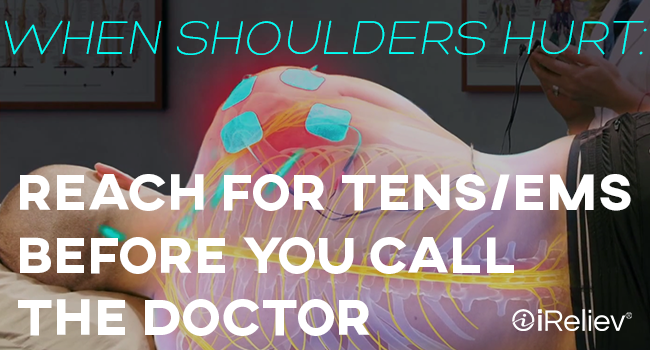 Can TENS/EMS Help with Shoulder pain? A good way to manage shoulder pain at home is available before you call the Doctor. A combo TENS/EMS unit is ideal at this point. 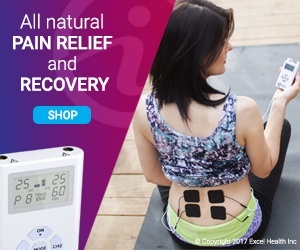 TENS can provide much needed pain relief while EMS can help increase circulation in muscles and joints to help reduce inflammation while also stimulating muscle contraction and relaxation, preventing further atrophy. Ice is effective and should be used but it can’t be taken on-the-go with you like a TENS/EMS combo can when you leave the house. But, managing symptoms through TENS/EMS is only part of the solution. Preventing shoulder pain is just as important as healing it. Specific strengthening exercises for Rotator Cuff Tendonitis symptoms can be found online and can help restore both strength and range of motion. When done properly, you can avoid overuse complications. Generally speaking, these remedies are the same treatment paths taken by your local Physical Therapist. If symptoms do persist or worsen, call your doctor and seek their advice but only after trying to remedy at home.